If you are certified, and looking for water time to GET WET and practice or play on SCUBA, this event is for you! Need to get certified? We can help you with that too! Click here to learn more about other classes we offer. *Certified divers are welcomed to get wet at the pool while sharing water time with our certification classes being held. *This is NOT a guided instruction event. There will be a staff member onsite to welcome you, show you around, explain the rules of the pool, and answer simple questions related to SCUBA diving. *PLEASE preregister for this event. * Please do NOT show up to the pool without preregistering. *During this event you are guests of New England Dive, not the pool facility. Please do not approach the facility for additional SCUBA options. 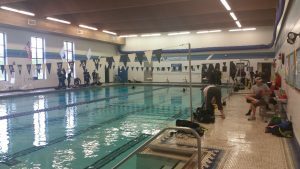 Contact New England Dive for additional SCUBA events at the pool. *There is a 4 person minimum for this course, we will contact you within 1 week of your course to reschedule if the minimum is not met. Please fill out the form below to request a space for this event. Space is limited, the sooner you sign up the better your chances are of guaranteeing that there will be space for you at the event. Note: Participants must first meet at New England Dive to sign waivers, pay fees, and collect equipment (if needed). There are different tiers of pricing for a Get Wet Participant. $50- If a certified SCUBA diver needs get wet water time and all equipment. $35- If a certified SCUBA diver needs get wet water time and Tanks & Weights Only. $25- If a certified SCUBA diver needs get wet water time only. $25- Each for snorkelers & additional swimmers to get wet.